The area around the Greek Hovel is deemed a good killing field and so twice now I have been forced to reverse either up or down a steep hill as a convoy of pick-up trucks travels the other way. Normally quiet tracks are now humming. 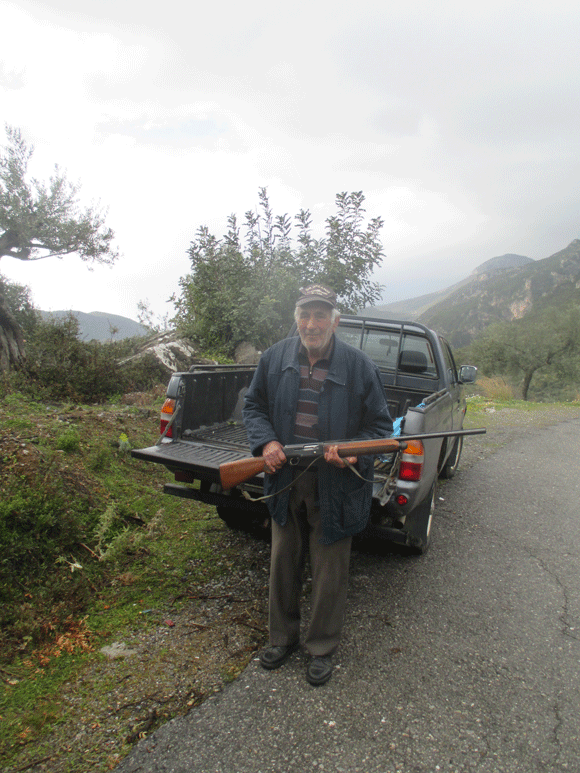 Up on the mountain roads one comes across stretches where every 200 yards for a mile there is a parked truck on one side of the road and a – usually old – man on the other with his heavy gun. I know the Mani has a gun culture. I am considered a total weirdo for not having one. In the old days of blood feuds (19th century and before) when a boy was born he was known as “a gun” and by twelve was expected to be fighting. I am a tremendous supporter of the right to carry firearms. Houses in Kambos do not suffer burglaries because a) there is not a lot to steal and b) the robber would get his head blown off. So the burglars focus on foreign owned houses by the Coast as the foreigners are richer and being woolly minded liberals would not dream of getting a gun. I shall be getting a gun this summer for rabbits and to let it be known that I am no woolly minded liberal should any burglars find their way up to Kambos. But I shall not take part on the bird shoot. It is senseless and pointless. Besides which, unlike the old men, I have work to do.